Grilling is one of the reasons I enjoy summer so much. The fact that I live in Arizona means I get to do more of it than just during the summer months too! Yep, I’m able to grill year ‘round here. Talk about a happy girl! Have you discovered the benefit of grilling for a healthier dinner meal plan? SO easy, so light, so yummy! Here's some specific ideas to help you make healthier (and yummier) salmon and chicken on the grill for your healthy dinners at home. If salmon is frozen, thaw completely. Pre-heat grill to medium-high heat, lay salmon filets out on flat pan or plate. Squeeze 1 full lemon evenly over the salmon. Sprinkle 3-4 garlic cloves, minced, over the fish. Press the garlic into the flesh. Sprinkle freshly cracked black pepper over salmon and salt lightly. Sprinkle ground onion, ground garlic, paprika and a light shake of chili powder if you like a little more flavor. Place salmon on light spritz of olive oil on aluminum foil packet on grill (if it has skin, you can place directly on grill plate - tastes better this way, in my opinion. Your fillets are now ready to grill slowly over low heat, for about 15 minutes, or until done. Additional Tip: Use fresh herbs, like dill, for extra flavor over salmon. Buy full boneless skinless breasts instead of tenderloins to save money. Cut chicken breasts into 2-3 pieces (tenderloin-style) to promote quicker cooking and portion control. Marinate breast pieces in a small amount of Italian salad dressing. I use Italian dressing because it’s a neutral flavor, keeps the chicken moist and from getting slimy/tasting weird as the week progresses. Make Ahead Tips: Grill enough on Sunday for meals through Wednesday, then midweek, grill a new batch for the remainder of the week’s meals. Cooking ahead like this cuts your prep time down and is a delicious grab and make option for those days you don’t want to be in the kitchen too long. Cooking for meals ahead of time will give you a quick protein choice for soups, salads, pastas, and sandwiches. It will be easier to stick with a healthier meal plan when you have these ready to grab and add, versus cooking them separately for each day’s meals. Tenderness Tip: Be sure to grill the chicken until JUST done (they’ll be white, NO pinkness), on medium heat. If you grill them on high heat or too quickly, you’ll end up with tough meat! Coaching tip: I've had people ask me about the "alleged" link between cooking on a grill and cancer. After researching this specific topic even further, I’ve found that so far, research has not concluded that grilling causes cancer. However, cooking foods too fast, at too high of a temperature and for too long can release carcinogenic compounds that contribute to some cancers. Cook (and Grill) Low and Slow! Got some of your own grilling tips you’d like to share? Leave your grilling secrets in the comments below or feel free to share them with us in our (free) FRESH Start Club! This shredded chicken recipe is a great “protein base” recipe, so that you have moist, tasty shredded chicken on hand for entrees later in the weekly meal plan, like salads, tacos, enchiladas or even to add to soup. The chicken is also ready to be additionally seasoned, for instance, use chili powder and garlic for a Mexican-flavored dish, or taco seasoning for a taco salad protein topper! Here’s how you make it. Add all ingredients together into a crock pot, cook on low for 6-8 hours, or high for 3-4. Once chicken pulls apart easily, it is ready! Let chicken cool, remove from crockpot, and shred. You’ve got shredded chicken! Heat the enchilada sauce in a deep fry pan over low heat. Place corn tortillas, 2-3 at a time, into the saucepan and soak them until covered by sauce. Remove, lay flat on plate. Once all enchiladas are rolled and placed together into pan, spread remaining enchilada sauce over the top, and sprinkle remaining cheese. Cover with aluminum foil and bake for 15-20 minutes. Then remove foil, put oven on broil (high) and bake for another 3-4 minutes. Watch it carefully as cheese may burn if left too long on broil. Remove finished enchiladas and enjoy with a side of rice and beans! FRESH n’ Healthy Tip: Garnish with a dollop of plain Greek yogurt instead of sour cream – it’s a protein-rich & healthier fat option! Looking for a supportive community of people who understand your health struggles and can help reach your healthy living goals? Join others who are JUST LIKE YOU in the FRESH Start Online Community! Are you tired of trying to figure out what to have for a quick meal? Why not make it super simple? Here is a bagel sandwich loaded with protein that you can make for your family when they need a nutritious dinner in a hurry! Combine it with some tortilla chips and a salsa or hummus dip from our selection here and you will have a complete meal in minutes. Here's how to make this easy sandwich! Spread whipped cream cheese on bagel. Add the chicken breast, 2-3 avocado slices, red onion strands, and microgreens. Filling, rich in protein, fiber, and nutrients – this sandwich is a winner every time! Just multiply these ingredients for the amount of sandwiches you desire to make. Nutrition Information: One cup of chicken has 231 calories, 5 grams of fat, and 43 grams of protein. It's low in sodium and is a good source of B6, phosphorus, niacin, and selenium. This healthy version of a classic favorite will have your family asking for more! It's a great balanced meal served with either gluten-free or whole grain pasta, (or with spaghetti squash, like in this pic!) It's filling with or without more sides. Coat the chicken cutlets in the bread crumbs, pressing the chicken gently into the crumbs to help them stick to the breast. Heat 2 Tbsp oil in a large skillet over medium-high heat. Spread 1/2 the homemade marinara over the bottom of a lasagna dish, and top with the cooked cutlets. Place the spinach over the chicken, and the rest of the marinara over that. Then top the dish with the cheese. Broil for 3-4 minutes on high, or until the cheese begins to brown. Try this simple, affordable 20-minute recipe, then let me know what your family thinks of it in the comments below! You can always post your healthy cooking questions or suggestions in our free online community as well!!! Come join the lively, ongoing conversation! Make Easy Homemade Thai Red Curry with this easy-to-follow how-to recipe! 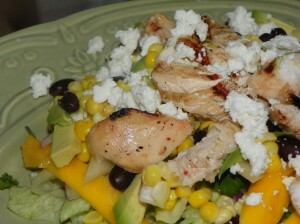 We just made this salad at the Healthy Changes Cooking Class we held Monday evening - mmm mm good! I thought it would be great to share this delicious recipe with you! Salads are still healthy – very healthy – IF they are loaded with rich greens, raw veggies, and lean protein. This salad is exactly that, full of all the right ingredients, and super tasty. Just squeeze a little lime over the top, and if using dressing, you only need a tablespoon drizzle. The salad itself is so tasty, you don’t need much dressing for taste! Toss all ingredients together for a flavorful, healthy treat! You can chill ahead of time or serve immediately. Enjoy! Enjoyed this FRESH dish? Get recipes for more delicious ideas right here in our Recipe Box! The tasty greens and protein in this Napa Cabbage Chicken Salad are always a hit at our house! This easy dinner recipe is a family (and guest!) favorite – we never get tired of throwing this easy, fresh dish together for a light dinner. Even though it's a salad, you might be surprised at just how filling it is just served by itself for a meal. The chicken and cabbage combination delivers lots of tasty nutrients, which help keep you full longer than most salads, yet it doesn't feel heavy on your stomach. Even the kids like it, and ask for this crunchy entrée often! Combine the shredded cabbage, green onions, and cilantro in a large bowl, cover and refrigerate until ready to serve. Heat a medium nonstick skillet over medium-high heat. Melt the butter, adding the ramen, sesame seeds, and almonds to the pan. Toast the mixture for about 3-4 minutes, or until browned nicely. Make sure not to burn them. To make the dressing, set a small saucepan on high heat, and add in all the ingredients together. Stir frequently, until the mixture comes to a quick boil, then immediately remove the pan from the heat. Let the dressing cool to room temp. Toss the salad mixture, crunchies, chicken, and dressing together just before serving for this quick and delicious dinner! Cabbage really is an under-rated superfood - rich in many nutrients, but most notably Vitamin C. Did you know that cabbage is actually higher in vitamin C than oranges? This salad is also a delicious source of potassium, sulphur, fiber, magnesium and vitamin E! I would love to hear how you liked the Napa Cabbage Chicken Salad after you make it! Share your food pics and happy faces in our (FREE) FRESH Start Online Community on Facebook or you can post a comment right here on this blog!